Clear Body Prevents the Pok�mon's stats from being lowered. This Pokemon's stats cannot be lowered. endlessly to CON� STRICT its prey and enemies. entrap its oppo� nent inside a poisonous net. weakens the prey by dosing it with a harsh toxin. It can catch up to 80 prey at the same time. Emerald It lives in complex rock formations on the ocean floor and traps prey using its 80 tentacles. Its red orbs glow when it grows excited or agitated. Leaf Green The tentacles are normally kept short. On hunts, they are extended to ensnare and immobilize prey. Diamond/Pearl It alerts others to danger by stridently flashing the red orbs on its head. 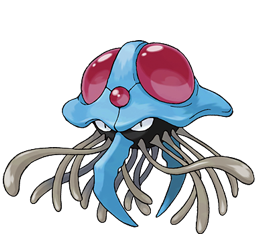 Platinum It extends its 80 tentacles to form an encircling poisonous net that is difficult to escape. Heart Gold Its 80 tentacles absorb water and stretch almost endlessly to constrict its prey and enemies. Soul Silver In battle, it extends all 80 of its tentacles to entrap its opponent inside a poisonous net. Black It extends its 80 tentacles to form an encircling poisonous net that is difficult to escape. White It extends its 80 tentacles to form an encircling poisonous net that is difficult to escape.